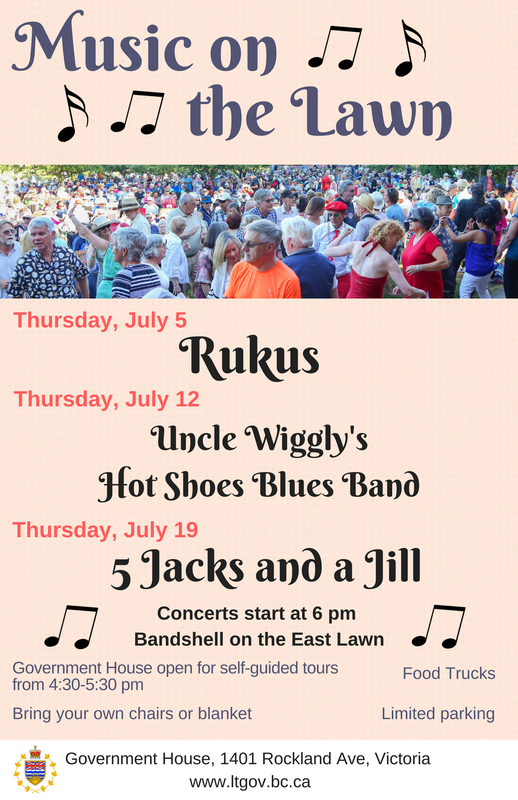 The Honourable Janet Austin, Lieutenant Governor of British Columbia, invites you to attend an evening of live music at the Government House Bandshell for the Music on the Lawn summer concert series! Concerts go from 6:00-8:00 p.m.
Bring your own blanket or chairs. Food will be available for purchase from food trucks or pack a picnic dinner. Tune up your guitar and put on your dancing shoes for Rukus, featuring classic rock favourites ranging from The Beatles to Elvis Presley. A cool way to spend a hot July evening– Uncle Wiggly’s Hot Shoes Blues Band croons your favourite blues. A high energy group guaranteed to bring the party, 5 Jacks and a Jill performs old faves and new hits. Government House will be open for self-guided tours from 4:30-5:30 pm. There are washrooms and limited parking on site. Click here for a map.